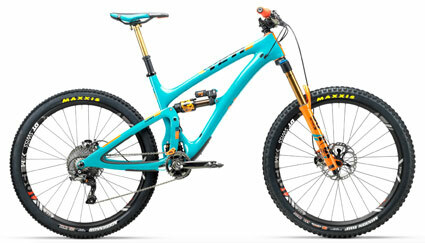 Ride the same bike as two-time EWS World Champion, Richie Rude and it's gotta rub off, right? The SB6 Team Replica brings you one step closer to harnessing the storied talents of our pro riders. Donning ample travel from Fox, 170mm in the front and 150mm in the rear, and a velvety Shimano XTR drivetrain this bike is where brawn meets beauty. Hung with the best parts from longtime Factory Team sponsors like Fox, Shimano, DT Swiss, Renthal, Chris King, Maxxis, One-Up and Ergon this is the bike that pulverizes EWS race tracks around the world and puts our athletes atop podiums. It's a limited edition, so don't delay - we have Yeti collectors around the world waiting for the next team edition. Let this sink in, the SB6 has more stage, race wins and overall championships, including back-to-back EWS World Championships, than any other bike on the Enduro World Series circuit. Racing is our legacy, heritage and the cornerstone of what we do. We race to win. Piloted by the best riders in the world, the SB6 in uniquely suited for pounding out big Enduro race days and taking on big terrain. The SB6 has six inches of travel in the rear, with 160mm up front and geometry that is manageable on the transfer, but optimized for smashing downhills. The SB6 Turq Series frame tips the scales at 6.05Ibs and is constructed from the highest quality Carbon Fibre available. The exact same frame is used by Factory riders Richie Rude and Cody Kelley on the EWS world tour. Thanks to innovations in Carbon technology, Yeti is able to adjust the fibre layups to drop 265 grams over the Carbon frame. When you're looking to win World Championships or your local KOM, every gram counts.